Published: Nov. 19, 2012 at 07:12 p.m. Updated: Nov. 19, 2012 at 11:07 p.m.
Mike Ditka suffered a minor stroke just three days ago, but the player-turned-coach-turned-analyst worked on ESPN's coverage of the "Monday Night Football" matchup between the Chicago Bears and San Francisco 49ers. Take a look back at the Hall of Fame career. "I'm fine, really, I feel good," Ditka, who broadcasted from ESPN's Chicago studio, told the Chicago Tribune. "I'm not ready to run a marathon or anything, but everything is back to normal." Ditka has been resting at home since being released from the hospital Sunday. The 73-year-old suffered the stroke in the back left side of his brain while playing cards with friends. "I kept dropping the cards," Ditka recalled, likening his awareness during the episode to the heart attack he suffered in 1988. "I couldn't talk. Everything was in slow motion. Luckily my friend took me to the hospital." Ditka was a Hall of Fame tight end who retired after the 1972 season. 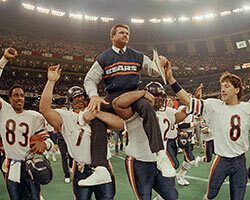 He became an iconic figure during his 1982-to-1992 run as head coach of the Bears, winning a Super Bowl in the 1985 season. He later coached the New Orleans Saints before moving into broadcasting. "We have no guarantees," Ditka said. "I've been here 73 years. It's been a great 73 years. I've been blessed. If it ended tomorrow, I have no complaints. But we have no control over that. I hope to stick around another 73."